Drive two miles southwest of Chicago’s beautiful Millennium Park and you’ll find yourself where it all started: a small fabric store on Roosevelt Road, where Dima Budron’s passion for fashion design began to take shape. It was here where Dima discovered her love for designing clothing and embarked on her journey as a protector of creativity. Dima’s love for finding interesting and unique fabrics was developed through her early college years, as she shopped through various fabric stores in the Chicago area. She dabbled in designing women’s clothing and later found her niche in making men’s ties and redesigning vintage apparel. Little did she know, she would later have her own design lab at home, equipped with the tools and sewing machines she needed to explore her skills and create special, one-of-a-kind items for her friends and loved ones. She even started a men’s tie and accessory line, cut short only by her need to focus on her graduate studies at DePaul University. But most importantly, it was through this first-hand experience that Dima discovered the importance of protecting the creative journey. With the investment in fabric and tools, not to mention time, it can be very expensive to turn creative imagination into something tangible. It’s a risky journey with no guarantee of a successful outcome. How awful to contemplate the disaster of any idea being stolen or inadequately valued. This is why Dima left fashion design and went to law school – she wanted to help protect creative ideas. While she still designs in her free time, Dima now focuses on helping clients attain adequate protection of their intellectual property. In the end, Dima has stitched together a seamless understanding of how important it is to protect the creatives. 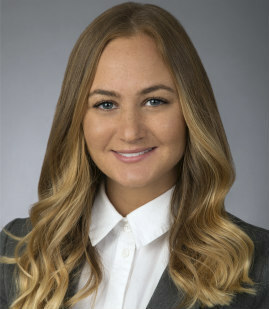 Dima S. Budron is an Associate in the Washington, D.C. office. She focuses her practice on intellectual property and transactional entertainment law, representing production companies, networks, studios, trade associations, and talent and content creators. Dima has experience drafting, negotiating, and reviewing contracts dealing with various stages of content creation such as funding, development, production, licensing and distribution. She also provides legal analysis and counseling on copyright-related matters, assists clients in licensing music rights, and represents trade associations in matters dealing with international trade and the protection and enforcement of copyright in foreign markets. Serves as counsel to International Intellectual Property Alliance (a coalition of five copyright-based industry trade associations – RIAA, MPAA, ESA, AAP, and IFTA – comprised of over 3,200 companies in the music, film, book publishing, and entertainment software industries) on international copyright protection and enforcement matters including drafting important government filings such as the annual Special 301 report and several of the United States Trade Representative’s Out-of-Cycle Reviews. Assists clients in obtaining rights to use music in audiovisual and/or music productions. Assists in counseling major studio client on theatrical and television rights upon review of the history of agreements and communications surrounding specific film productions. Provides clients with legal opinion on the use of titles for movies or television shows. Assisted in drafting and negotiating two separate funding agreements for production company client’s two television series. Represented the Motion Picture Association of America (MPAA), the Recording Industry Association of America (RIAA), the Entertainment Software Association (ESA), and the Association of American Publishers (AAP) in the 2018 Copyright Office rule-making proceeding regarding proposed exemptions to an anti-circumvention provision of Section 1201 of the Digital Millennium Copyright Act. Represented entertainment client in negotiating and finalizing a trademark licensing agreement for an important program. Assisted in administrative litigation before the Copyright Royalty Board regarding royalty distribution for cable retransmissions, representing the copyright owners of syndicated series, movies, and specials broadcast.